A ferry crossing at a tiny village in Cornwall is amongst the most picturesque in the world, according to a travel writer. 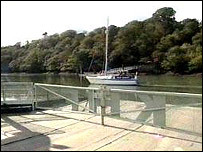 The King Harry Ferry at Feock takes cars and passengers on a 450yd (412m) trip across the River Fal. It is the view of the river which has put the ferry crossing in the top 10, rivalling Lake Titicaca in Bolivia and the Grand Canal in Venice. The report was compiled by independent travel writer Ryan Levitt. Tim Light, the managing director of the ferry, says it was a complete surprise when he was told the news by Cornwall Enterprise. He said: "I think the ferry's popularity is down to a combination of the unique natural environment and wonderful history." 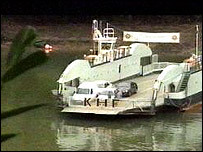 The current ferry has been in service from 1974. It carried 300,000 cars and a million people last year. It is thought the ferry may have been named after King Henry VIII, who spent part of his honeymoon with Anne Boleyn at nearby St Mawes Castle and signed a charter for a ferry service.